sailboat. 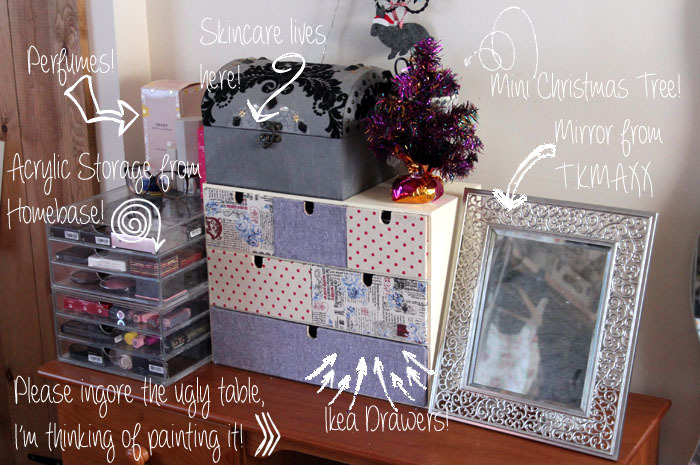 : Make Up Storage: Blogmas Day 5! I still love my acrylic drawers from Homebase but I didn't want to get anymore because a) I think any more stacked on top would look a bit silly and b) they don't really hold very much & I had a few products with chunkier packaging (MAC Face & Body and the ELF HD Powder) that just don't fit. Definitely going to keep the ones I have though because it's nice being able to see where everything is & it makes me keep everything tidy! I was in Tesco the other evening doing grocery shopping (am I the only one that feels like they spend half their life in supermarkets?!) and I spotted this little Christmas tree, all on its lonesome. I felt bad for it and it made its way into my trolley. Seriously, it was 84p. They'd reduced it from 98p. That made me chuckle. My next project is the table, it was a cheapy purchase from Argos many years ago so it's done well, it just doesn't look very pretty. I have some cream paint that I think I'm going to use & I might change the drawer knobs to something a little more sparkly. Now, I just need to get around to it. If only there were more hours in the day, eh? That'd be nice! How do you store your make up? I'd love to know/see! If you have a blog post about it, link me in the comments! Love your wee Christmas tree - such a bargain. I want one in white haha! It looks lovely! In the picture you can't tell that you put too much fabric, it just looks totally cute. Wish we had an Ikea around here! I feel the same about acrylic drawers, they're nice and handy but don't hold very much. Ikea have a new range of drawers that you can stack and they're pretty cool. Love this :) The Ikea drawers are super lovely, and I have the homebase drawers too! I spend a good 80% of my free time in Supermarkets. Drives me mad I tell you!! Love your IKEA storage though, thinking I might have a go and get some but paint them white... might be nice? Love your little acrylic drawers! Your make up is much more nicely presented than mine! I just have mine shoved in a box and hidden away under the bed! And your chest of drawers would look really nice in white/cream :) I wish all my drawers were that colour instead of the boring brown they currently are! Yours are absolutely gorgeous, I love the idea of covering them in fabric. You picked really pretty colours! Here's my post if you'd like to have a nosey! Ah you are so much more organised than me! I love all the storage boxes from Tk Maxx and they seemed to be reasonably priced too - I need to invest! Oooh this is so organised Jennie! Better then mine, mine sit in baskets under my mirror, handy but dusty. I need to find something with lids, the ikea drawers are cute - tempting. Plus, your 'I only have one face' comment made me laugh. I love buying make-up, have loads and its just for one face...hahaha! Ooooh please paint the table and then show us how it turned out!!! I love this storage! I have two pink plastic mini drawer sets from discount world which have about 3 drawers and a top bit which flips open. I also have a couple of pretty TK MAXX storage boxes - one filled with nail varnish and the other has things like excess items, GB perfume samples & stuff I don't tend to use. great ideas!! Thank you so much! the ikea drawers are just lovely! I know what you mean with the homebase storage. There are some bits that I cant fit into mine which is annoying! I do like the look of the ikea draws, however I dont think I have a big enough collection to fill them plus the acrylic draws.. It will only make me want to buy more makeup! And I've been pretty restrained recently! The mini Christmas tree is so cute, I probably would have taken pity on it as well hehe! I arrange all my make-up and skin care products on a bookshelf. I know it will get really disorganized at some point because, of course, your make-up collection is going to look like a make-up counter someday anyway, but yeah. I like to be able to see what I have instead of knowing where my things are. love this and yes,you really should paint the table,do mot worry if it does not be perfect,it will look vintage,there are many you tube videos and posts that will help you! The grey bun behind the tree, has his little Santa hat on. This is a really weird comment, and even weirder that its on such an old post, but I got the exact same Christmas tree in the exact same scenario haha.